Secant Graph : We know that sec x = 1 /cos x. 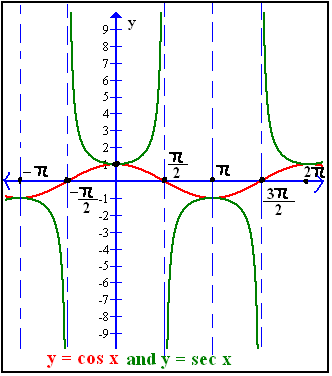 The cosine function has period 2π so the ecant function has also period 2π. As secant is a reciprocal of cosine function so for some values this function is discontinuous. We know that sec x ≤ -1 or sec ≥ 1. First, we graph y = cos x and then y = sec x immediately below it. Compare the y-values in each of the 2 graphs and assure yourself they are the reciprocal of each other. phase shift=c/b=1/π= 1/3.14 = 0.3184 So the graph will shift to right side by 0.3184 units. Now you can easily graph this. 5) What is the period of y = −4sec(πx)? 8) What is the period of y = 2sec(x/8)? 10) What is the period of y = sec(-2x)?